Electronics — HikerBeta Become a Patron! I only used the 21W solar panel through the 460 mile snowy Sierra section when there wasn't any dry trail to follow. In situations where I was relying heavily on my electronic navigation, I wanted the ability to charge my devices from a source that wouldn't run out (a.k.a. the sun). When there's dry trail, I'd recommend only carrying a charged battery pack. Solar panels are usually inconvenient, heavy, and bulky in comparison. The best (correct me if I'm wrong...) mAh to weight ratio among portable battery packs. 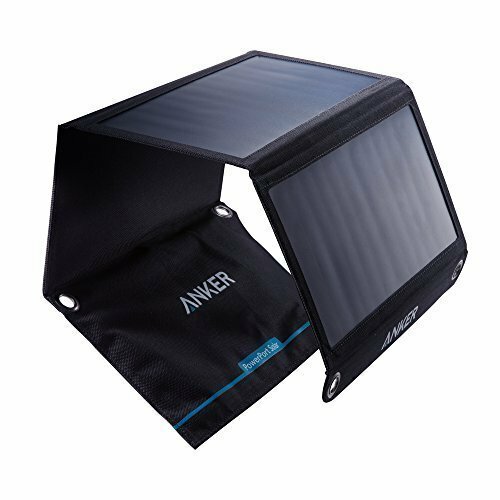 Provides enough power to charge your backpacking electronics for several days. It can charge my Samsung Galaxy S7 phone and my Delorme InReach in between resupplies. This 10,000 mAh stayed part of my arsenal for the entire trail. 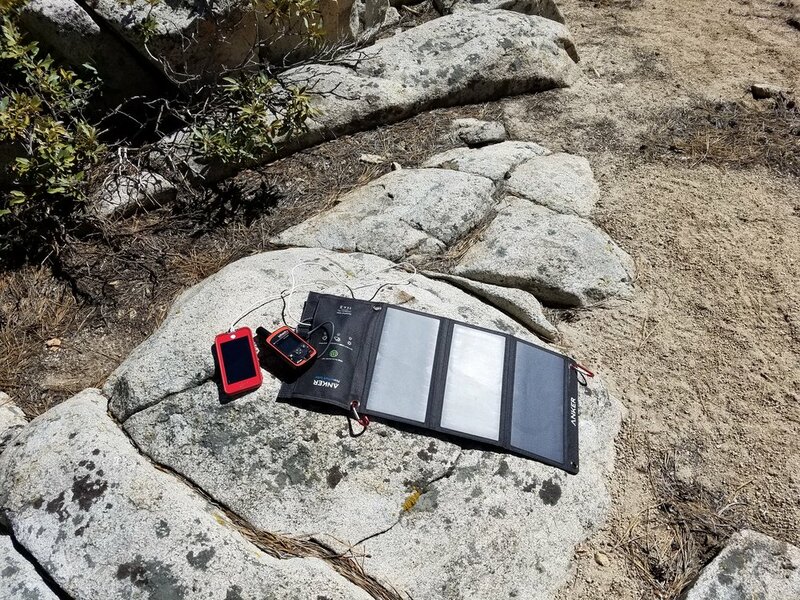 I learned that the capacity of this battery pack could recharge my inReach, Samsung S7 phone, Black Diamond Iota headlamp, and iPod Shuffle for about four days without restricting use. If I wanted to conserve power, I could stretch use of all those electronics to about six days. Keep in mind, however, that constantly thinking about conserving power for five months gets exhausting. Also consider a huge downside to having JUST enough power... accidental discharges. Like all those times I felt my phone getting hot in my pocket, realizing that the trail demons had magically turned my camera on for the last two hours, killing my battery. Over five months, it's guaranteed to happen a few times. I added the 20,000 mAh battery to my pack to simply ease the day-to-day worries with power consumption. Although roughly twice as heavy as the 10,000 mAh battery at 12.6 ounces, this battery worked it's way into being a mainstay in my lightweight setup. Simply because I didn't have to worry about power. If I wanted to listen to podcasts all day, I could. Play some music while I whip up my morning coffee? Why not?! Play a quick game of Catan, killing a quarter of my battery in the process? No big deal. I found that relief of stress to be perfect for me. I wasn't out there to stress about whether or not I could use power to write in my journal that night. Hell, I wasn't on the PCT to stress... about anything. 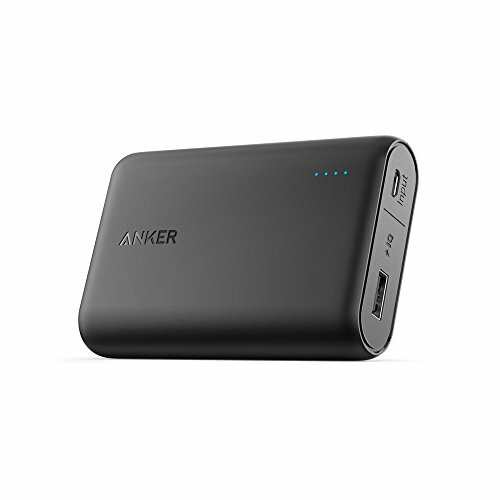 The 20,000 mAh battery held charge for seven to eight days of unlimited electronics use. With some care... it would last for two weeks. I was even able to skip the whole hang-out-by-the-electrical-socket thing at a couple resupplies. The bigger battery is worth every ounce. 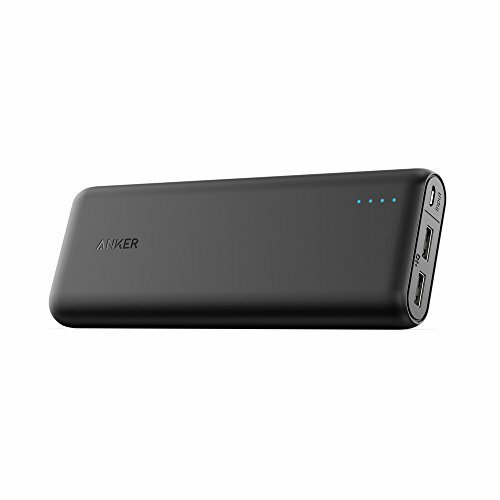 SUPER high quality stuff from Anker. Bottom line: If you only want to buy ONE battery for the entire trail, the 20,000 mAh battery will fit every scenario, where the 10,000 mAh battery won't quite cut it on some longer stretches. 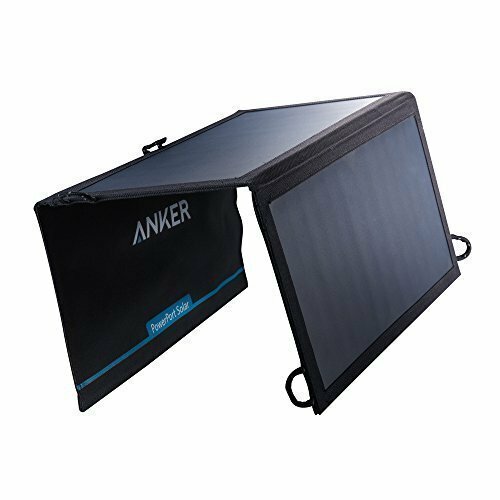 Note: There are Anker Powercore II models out (both 10,000 and 20,000 mAh) that charge electronics a tad quicker, but that faster charge results in more electrical losses, therefore fewer actual charges. They also weigh a bit more. I'd stick with the original Powercore models for now. I actually use the previous version of the InReach before they were bought by Garmin. The newer version (pictured above) integrates maps into the device itself, which is much easier. 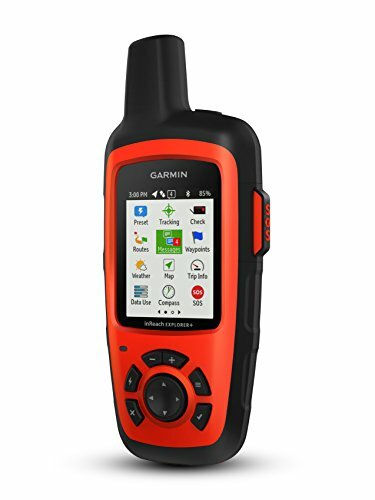 A necessary piece of electronics in the backcountry for peace of mind, communication, weather reports, and navigation. The inReach packs a punch well worth its weight, but it's definitely expensive to both initially purchase and then pay for the monthly subscription charges. The S7 has great battery life on airplane mode, is water resistant, and is an endless source of information. I'll mainly be using Guthook's PCT and Hikerbot apps to stay informed on the trail. I'll also be using Earthmate, which pairs with the InReach to more easily send out messages and navigate. The new age of water-resistant smartphones is making thru-hiker's lives much easier. This phone went the entire length of the trail without an enclosed, waterproof case (like Lifeproof). It was dropped in creeks, snow, mud, sand, and on hard surfaces with almost no noticeable marks to show for it. It worked well the entire time and although I prefer bigger phones typically (like the Note series... when they're not on fire), the smaller S7 weighed less, consumed less power, and was easier to use one handed. Smartphones are a touchy (heh heh) subject in the outdoor world, but you'd be hard pressed to show me a more versatile use of six ounces in your pocket. 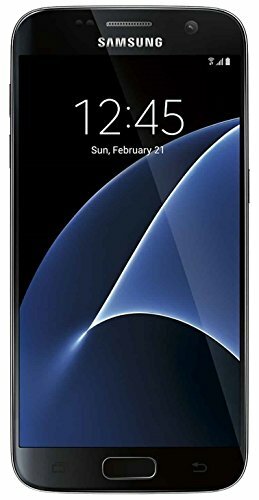 The only downfall is that the S7 was by far the most power-hungry piece of electronics. Two days of normal use was usually all I could get out of a battery. 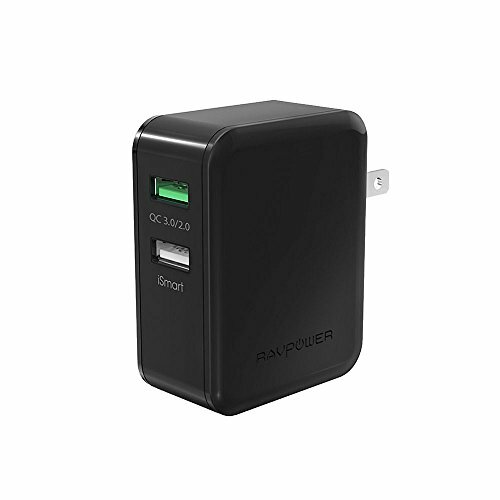 This cube has two ports, one of which supports Qualcomm Quick Charge 2.0/3.0 for my Samsung S7 phone. These chargers are important gear for speeding up charging times during resupply stops in town. Did exactly what it needed to; charge my phone, inReach, and battery pack fast enough to get back on the trail. Rugged and durable. Would highly recommend RAVPower, they make great stuff. Super bright, but admittedly outdated and heavier gear than what I could have. This headlamp did well enough, but I ended up wanting something rechargeable and lighter. I ended up landing on the Black Diamond Iota. This is an awesome little headlamp. 1.9 ounces makes it almost invisible. Rechargeable (no more carrying backup batteries), bright, and tough. I carried this headlamp through the Sierra all the way to the end. Always reliable, even in some 15F mornings. Never had a problem with the cold affecting the battery life either.